We present first results from an ongoing program of combining data from the Nancay Radioheliograph NRH and the Giant Meterwave Radio Telescope GMRT, to produce snapshot images of the Sun at meter wavelengths. The data processing includes a superposition of complex visibilities from NRH and GMRT, a Fourier Transform and a cleaning multi-scale algorithm. We show results from a simulation and an observation of a complex noise storm at 327 MHz on August 27, 2002. 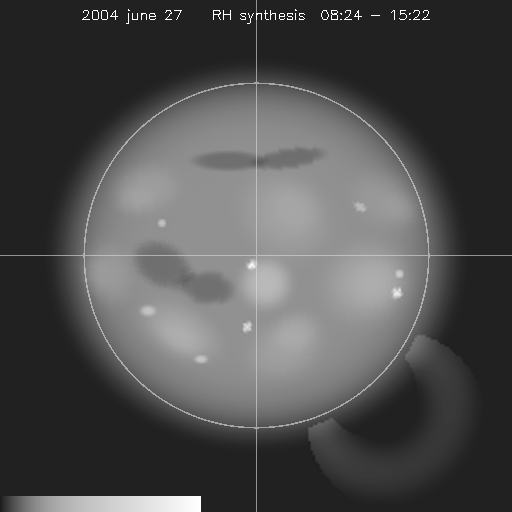 This illustrates the capacity of the method to produce high dynamic range snapshot images of a complex Sun, and shows that composite images are by far better than images from either instrument alone. Radio interferometry gives direct access to points in the Fourier Transform plane (uv plane) of the brightness distribution. The uv coverage is related to the set of available baselines in the antenna array. Images are subsequenty obtained through a Fourier Transform, usually with a fft algorithm. 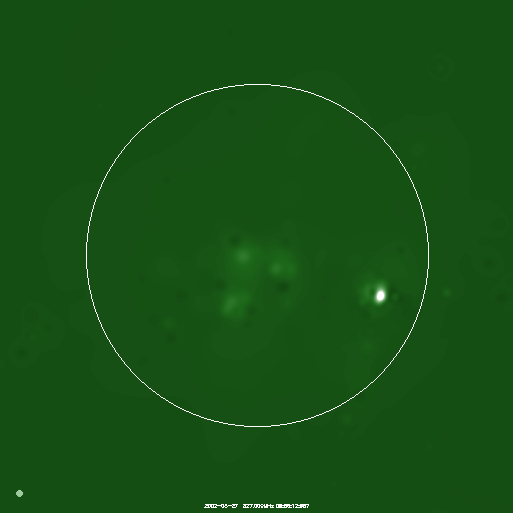 Imaging variable coronal radio sources is difficult. Rotational synthesis imaging is excluded, and the uv coverage is usually poor. This reduces the dynamic range in the images. Now there are several instances in physics of solar corona where both high resolution and high dynamic range are essential : structure of non-thermal radio bursts, CMEs, propagation of radio waves in the turbulent corona, etc. We combine here data from the 576 baselines (up to 3 km) of NRH and data from the 435 baselines of the GMRT (up to 27 km), to obtain solar radio images with unprecedented field, resolution and fidelity. uv coverages from NRH and GMRT are complementary. NRH provides a dense and homogeneous uv coverage near the origin of the uv plane (up to about 1000 λ by regular steps of 50 λ at 327 MHz, giving a good description of large scale structures in a field of one degree, but with a low resolution of 3 arc minutes. GMRT uv coverage is less dense for small baselines, which leads to an “aliasing” of large structures, but extends to baselines of 20000 λ, allowing a resolution down to 20 arc seconds. The principle is to combine NRH and GMRT uv coverages, after a suitable intercalibration of both instruments (which can be complex). The figure gives an example of the resulting uv coverage. The axes of the image are graded in multiples of the wavelength. For investigating the possibilities of the composite instrument, we made simulations with several models of the Sun. One model is presented here in the image on the left. The uv coverage of GMRT is sparse, especially for large baselines. This produces artefacts on the image obtained directly by fft, rendering necessary the use of a cleaning procedure. The standard CLEAN procedure performs poorly when sources exhibit a variety of scales (Wakker and Schwarz, 1991) and we used here a specific multi-scale CLEAN version. Futhermore, for a complex source as shown here, the cleaning procedure itself produces artefacts and GMRT baselines beyond ~10000 λ must be excluded. The obtained composite image is shown on the right. The various spatial scales are properly rendered and the resolution is better than with NRH alone by a factor ~3. On August 27, 2002, there was a strong noise storm beyond the West limb and two weaker noise storms near the center of the disk. 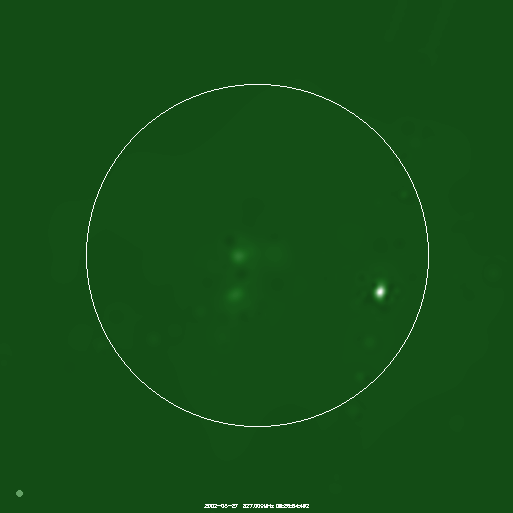 A group of type III bursts occurred near the weak noise storms at 09:04:04 UT. The images below show measurements at 327 MHz. 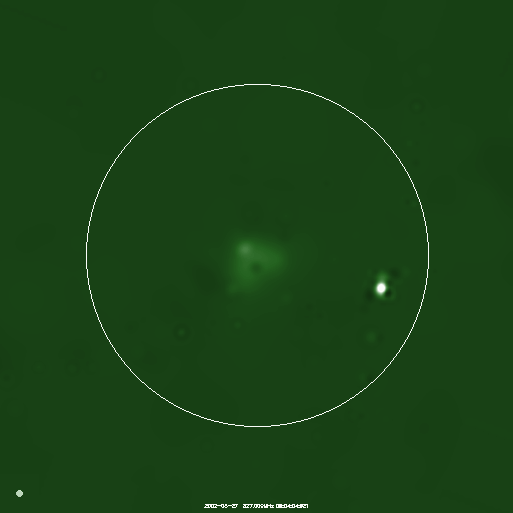 The larger sizes of the type III bursts near the center of the disk are obvious. The size of the intense West limb storm is ~50 arc seconds. 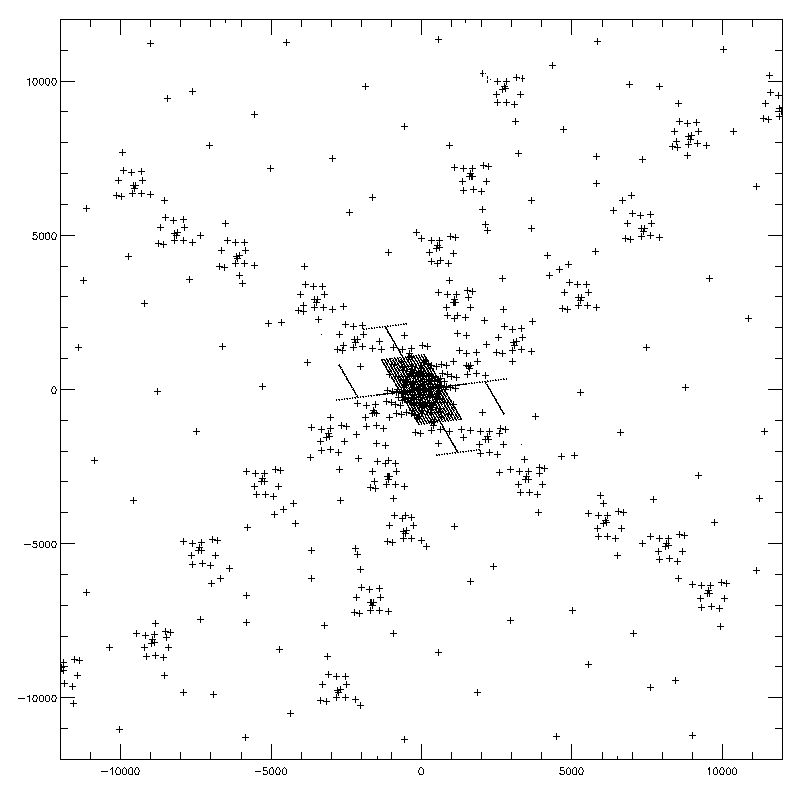 This is comparable to the sizes reported by Zlobec et al. (Solar Phys. 1992, 141, 165-180) from VLA observations, but the dynamic range on the images here (maximum/rms artefacts) is far better (~300 instead of ~10). We conclude that combining data from NRH and GMRT is possible. Composite images have unprecedented resolution and dynamic range. This opens a wide field of studies on solar coronal phenomena.